Wild rabbits are primarily nocturnal animals and it is generally at night when they will wander further away from the safety of their warrens. With that in mind, therefore, it is easier to spot a considerably larger number of the animals during the night than it is to do so during the light of day. It may sound like some fable or old wives tale, but it is completely true. Rabbits are prolific breeders. Studies have shown that A female is capable of reproducing from early an age as four years old and can give birth to a litter of anything between three and six, each and every month. Although they look cute and cuddly, they can cause a great deal of damage to property, gardens and almost anything else. They have an insatiable appetite and one rabbit will consume more than a pound of green food every day. As they like to nibble at the bark on young trees and dig holes to build their warrens, further damage is caused. All of this and the fact that that they deposit large quantities of droppings over the ground. You might think to yourself that you may be able to get rid of this pest on your own, or because you have a read a DIY or How To article online, that you now know what you are doing. However, if you want to make sure the problem of unwanted rabbits on your property is sorted, it is recommended that you leave it to a professional pest control team that know what they are doing, where and why. Due to the fact that rabbits are found in various places, the control methods used for this pest are varied. While it is true that discretion is necessary when handling rabbits in sports fields or other public areas, a different approach is needed when dealing with animals found in wide open farmlands and private gardens. This is why it is vital to choose a professional pest control company such as ours, when dealing with wild rabbits. We know how best to assess the situation, the location and which control method is best. Ferreting involves ferrets being guided towards warrens so that they will make their way inside and flush out any rabbits that may be inside. They will then be shot or caught. This is one of the main control methods used when rabbits have taken up unwanted residency in public spaces. If placed in the correct places, live catch traps are a very efficient way to deal with a rabbit problem. This is a particularly effective method if you have rabbits coming in from a neighbour’s land. Another effective method of dealing with pesky rabbits is by using drop box traps. Drop box traps tend to be used as part of an ongoing rabbit control and prevention plan, and when used properly they can catch a great number of the animals. Lamping and shooting are incredibly effective and efficient methods of controlling rabbit problems. Before either of these control methods are used, full risk assessments will be carried out. These are normally used during the night to cover large areas of ground. That way, the rabbits are easily dealt with because they are not aware of our presence. Following on nicely from the method above, as rabbits are generally nocturnal animals, one of the best and our favoured control methods is to shoot them under darkness using night sights. Large groups of rabbits can be dealt with in a short space of time, without the animals being aware of it using this method. Although this is one of the most widely used rabbit control methods, it should be done with the correct level of care and attention as Aluminium Phosphide Gas can be very dangerous for humans. Before this is method is implemented, we would need to carry out a full COSHH and wildlife assessment of the area in question. While the above methods are fine when utilised on their own, it certainly wouldn’t hurt the situation to use rabbit exclusion fences to make sure they are kept out of the places you want to be free from wild animals. Exclusion fences are a great form of preventative control against rabbits. As you can see there are various forms of pest control we utilise when dealing with rabbits. If you attempt to use any of the methods listed above on your own, you could actually waste a lot of time and energy without actually solving the problem. That is where we come in. We pride ourselves on offering the best customer service and experience we possibly can. 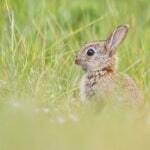 We will keep you fully informed throughout the rabbit control problem. Before we start, during and even after we have completed the task. After all, we want you to feel confident in our abilities and the informed and educated decisions we make and control methods we use. Remember that we are a people-orientated company and that if you have any questions or queries that you have not been able to find the answer to here; don’t hesitate to get in contact with us and we will be able to provide you with the answers and information you need. Rabbits that are running riot on your property or in public spaces they shouldn’t be on can cause a lot of expensive damage. By hiring an qualified and experienced company such as ours to deal with the problem though, will give you real peace of mind and a property that is eventually rabbit-free and rabbit-proof.